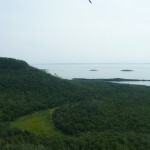 Sleeping Giant is located at the south tip of the Sibley Peninsula in the Sleeping Giant/Sibley Provincial Park about 25 km due east of Thunder Bay. 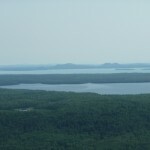 To get the park from Thunder Bay take Highway 11 east for 47 km to the junction with 587 and then south on 587 for 34 km. 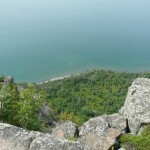 Depending on your destination on the Sleeping Giant, there are a few options for the trek. 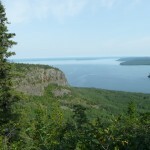 As stated above, probably the most popular destination is the Chimney Lookout on the Knees and can be reached by taking the Kabeyun Trail from the South trailhead on 587 just a few km south of the Marie-Louise Lake Campground. 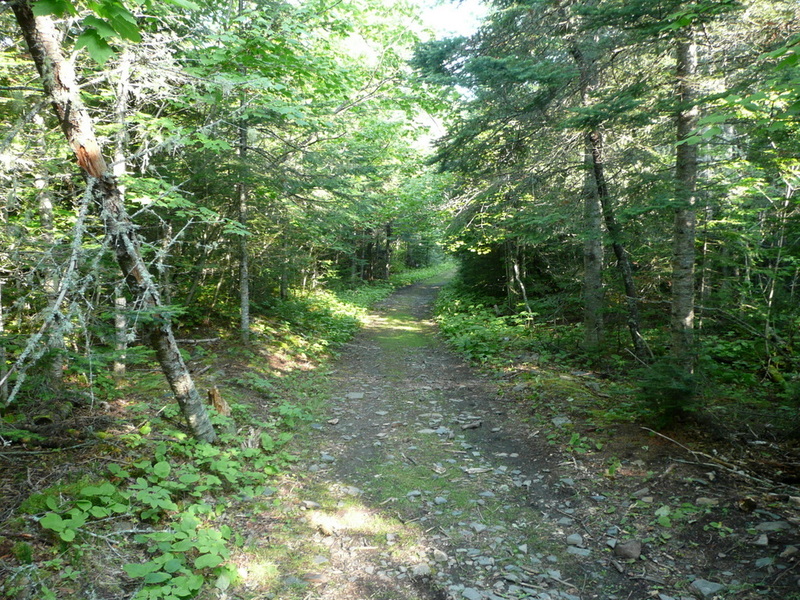 Take the Kabeyun Trail west for 7.5 km to the junction with the Talus Lake Trail. Take the Talus Lake trail north for 0.8 km until it’s junction with the Top of the Giant Trail. 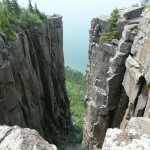 This trail steeply ascends the Sleeping Giant and terminates in 2.7 km at the Chimney Lookout. The Nanabosho Lookout on the Chest although not as spectacular as the lookout on the Knees nevertheless features an impressive vista. To get there, follow the Sawyer Bay Trail which branches off the Kabeyun trail, a short distance from the trailhead on 587. 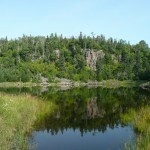 Follow this trail for 2.5 km at which time it is joined by the Sawbill Lake Trail. 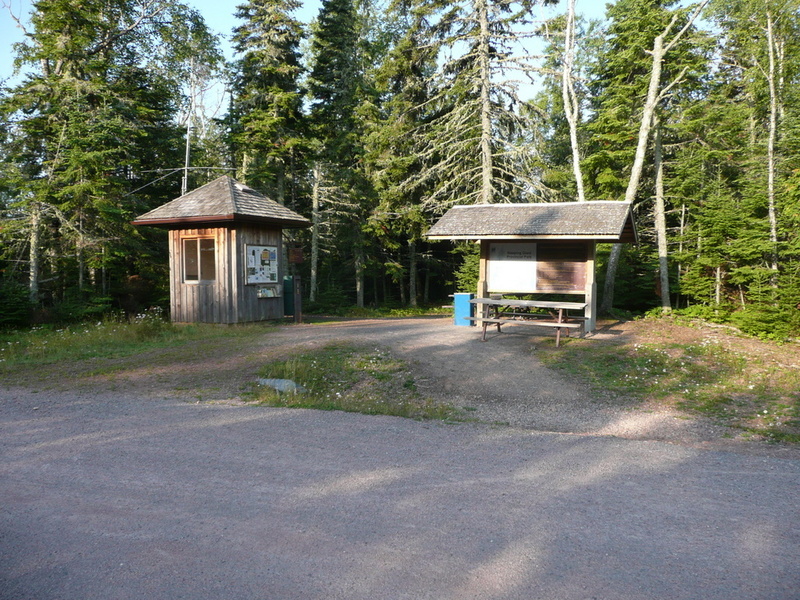 Another option to reach this point is to take the 2.3 km Sawbill Lake Trail from the Marie-Louise Lake Campground. 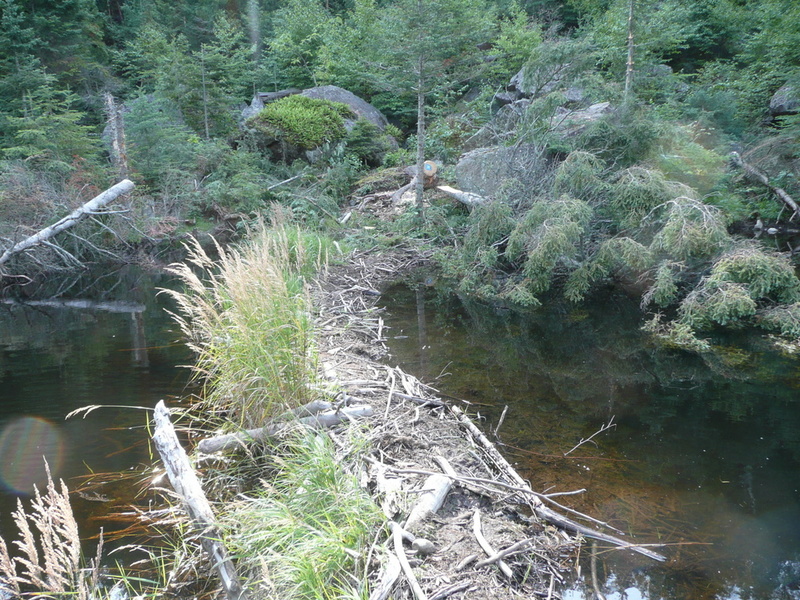 After this junction, continue west on the Sawyer Lake Trail for 3.0 km where the Talus Lake Trail will branch to the left. 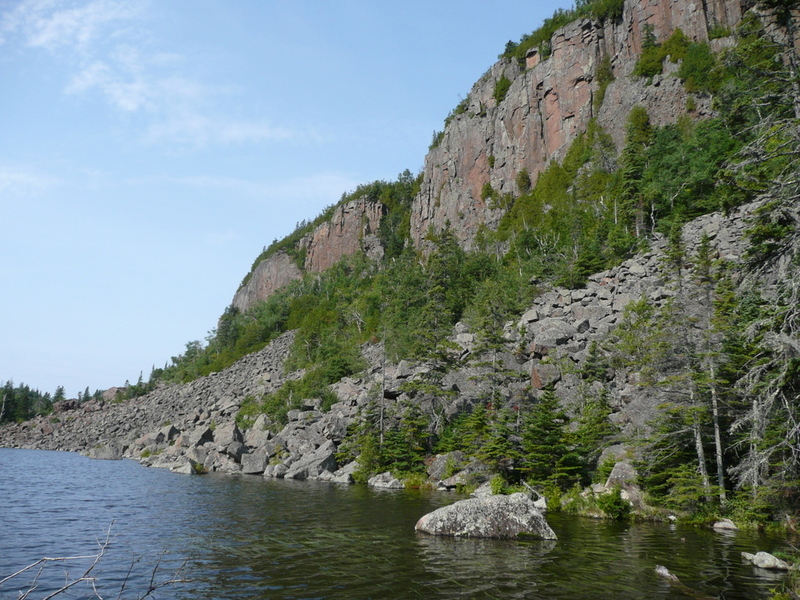 Follow the Talus Lake Trail which starts the ascent up to the col between Thunder Mountain and the Sleeping Giant for 1.5 km. At this point the Chest Trail / Nanabosho Lookout Trail branches to the right. 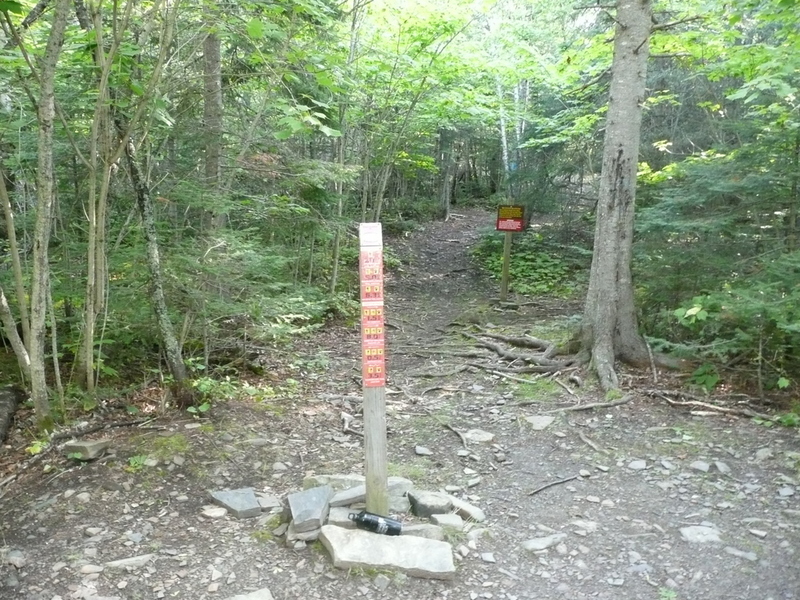 Follow this trail north for 1 km to the lookout. It is also possible to follow the Talus Lake Trail south to the junction with the Top of the Giant Trail to ascend the Knees. 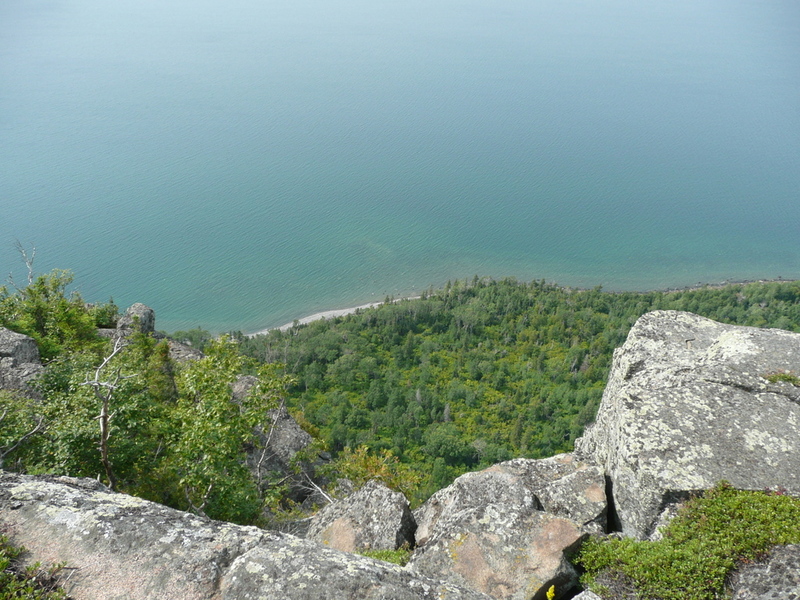 The actual highpoint on the Sleeping Giant at N48 21.032 W88 53.910, has no trail to it, and is most easily reached by bushwhacking from The Chest Trail, once it fully ascends the Chest. It is most likely easiest to avoid the notch which lies between the Chest Trail and the summit by starting the bushwhack from the high point along the trail at N48 21.254 W88 53.430 and follow the ridgeline and arc southwest to the summit. See this trip report for directions. 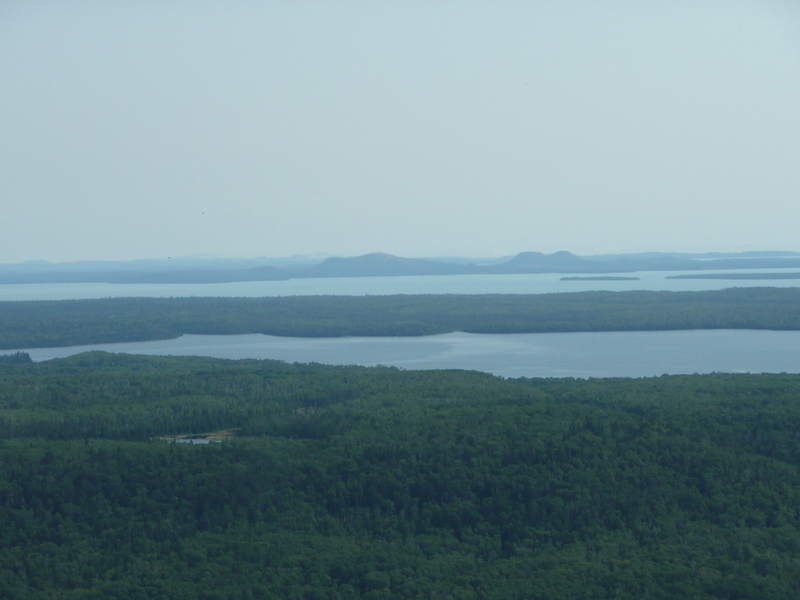 The Kabeyun, Sawbill Lake and Sawyer Bay trails are maintained and well graded and biking is permitted along them. 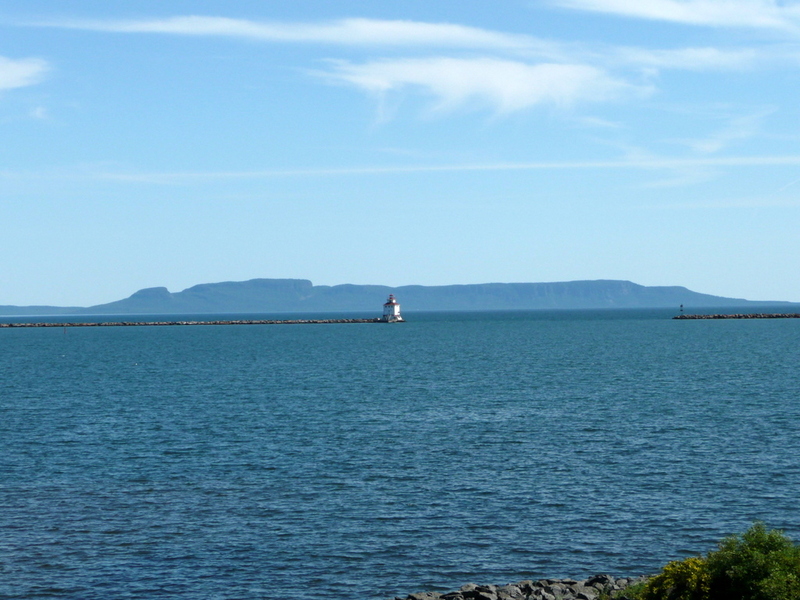 Sleeping Giant was my last destination on my Thunder Bay hiking road trip. 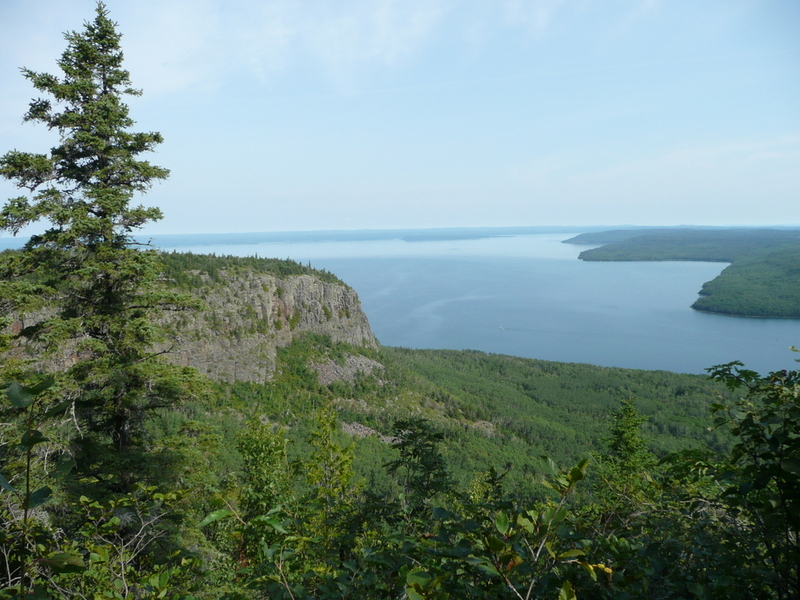 I had left Thunder Bay the previous day and managed to walk in and get one of the finest campsites in the park –140A in the north campground. 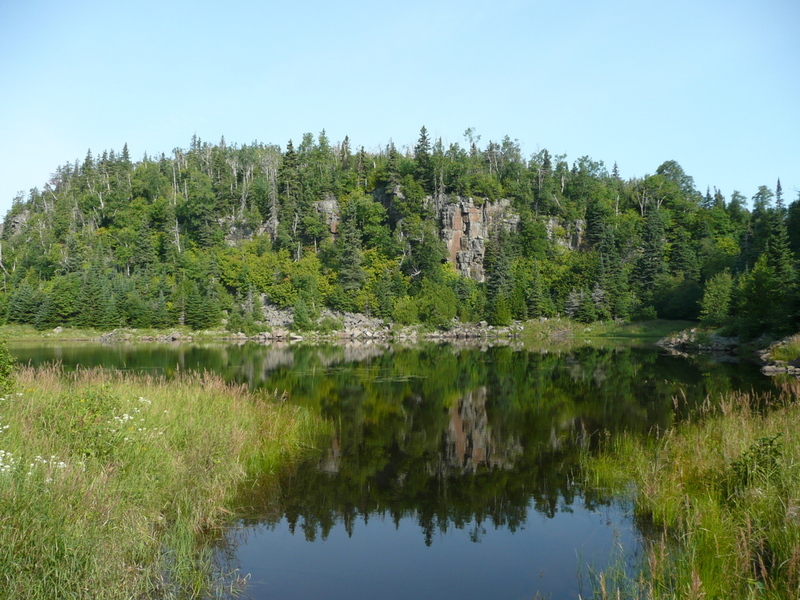 It is located at the end of a small peninsula jutting out on Marie-Louise Lake with a fine view of Thunder Mountain across the lake. 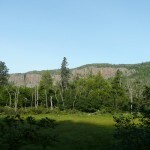 For this trip I was really looking forward to hiking on established trails and I dismissed bushwhacking to the highest point on the Sleeping Giant, since I was now getting tired of thrashing through trees and scrub. 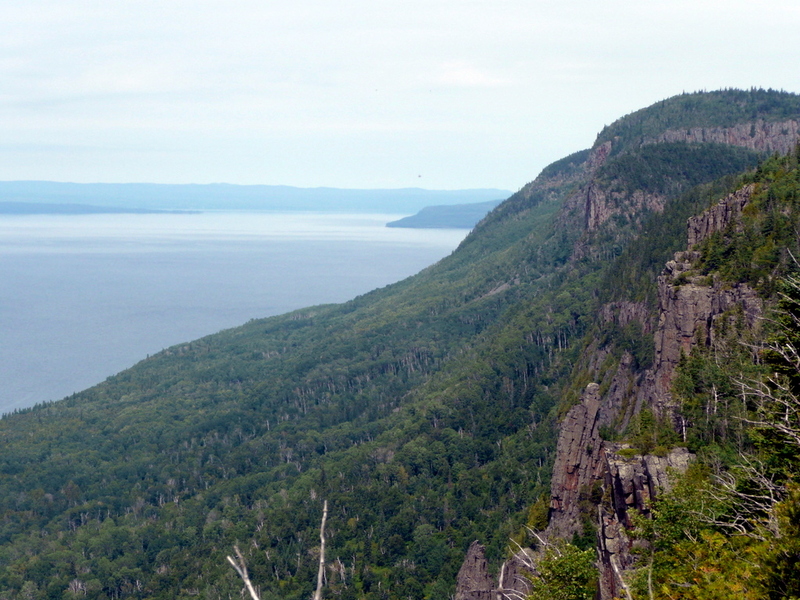 I decided that with the aid of my mountain bike I could get to both lookouts — on the Chest and Knees and back to the campground in a day hike. I had various scenarios to choose from, and in the end I decided to take advantage of the biking opportunities and bike in along the Kabeyun Trail which according to my map looked the most level. 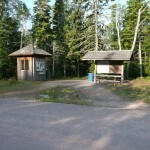 I arrived at the Kabeyun South Trailhead in the morning, unloaded my bike and started off shortly after 9 AM. The Kabeyun Trail which looked to be an old 2-track road was in good condition and was a really enjoyable bike ride through the woods. I made excellent time on the trail and only 30 minutes later arrived at the junction to the Talus Lake Trail. 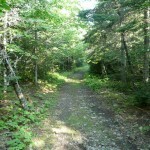 Already 7.5 km under my belt, I locked my bike to a tree, and started my hike up the trail. 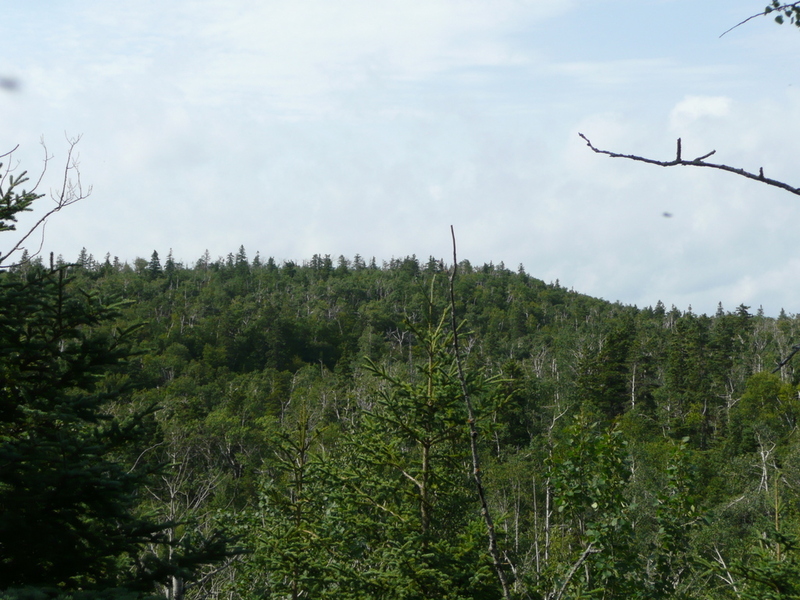 0.8 km up the trail, the Top of the Giant Trail branched to the left. I decided I would ascend this trail up to the Chimney Lookout on my way back and proceeded north towards Talus Lake. 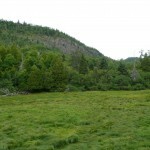 The trail passed an open marsh area just past the junction and began to climb moderately. 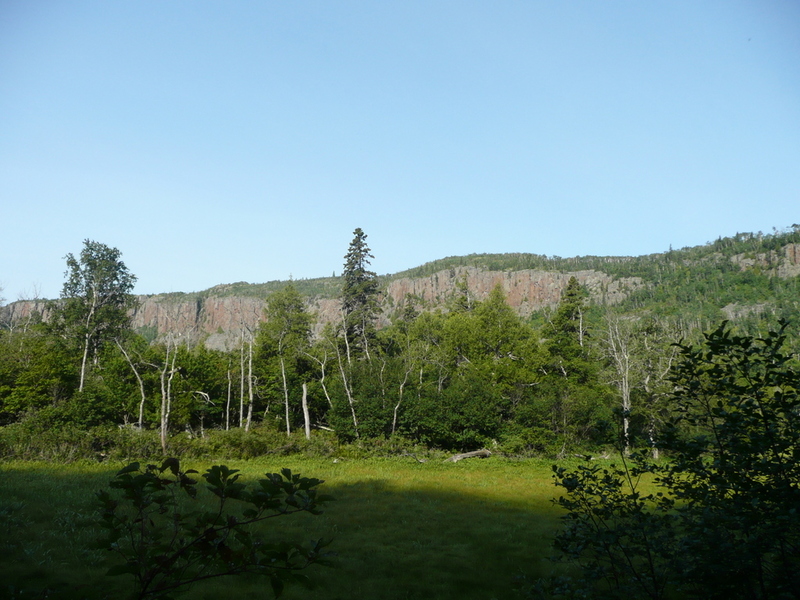 1.3 km from the junction with Sleeping Giant however, the trail began it’s steep climb up to the col between Sleeping Giant on the left and Thunder Mountain on the right. 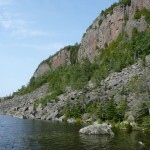 After reaching the height of land the trail leveled out and passed by a couple of small lakes (Norma and Helen Lake) with nice views of the cliffs along the eastern edge of Sleeping Giant. 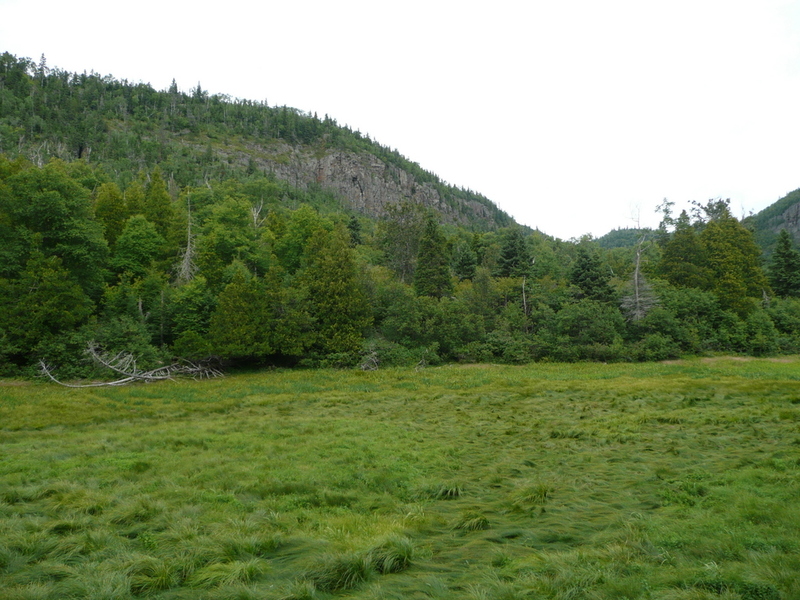 Beyond the lakes, the trail crossed a large talus field and I had to rock hop across it for a few hundred feet. 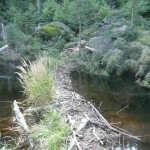 The trail then skirts the eastern shoreline of Talus Lake, crosses a beaver dam along the eastern shore and shortly past the lake meets up with the Chest / Nanabosho Lookout. As I had already made most of the elevation gain on the way up the Talus Lake Trail, it was only a 300 foot climb over a 1 km distance to the lookout. Along the way I kept my eye open for the height of land along the trail which I judged at 1707 feet (which was only about 100 meters south of the lookout) and any possible herd paths that headed out towards the highest point on the Giant. I didn’t find any convincing paths and although the brush was only moderately thick, there were numerous fallen trees to avoid and rock ledges to ascend. I also lost my full water bottle on one of my exploratory bushwhacks and it was then that I decided to stick with my plan for the day and declined to bushwhack over to the summit. 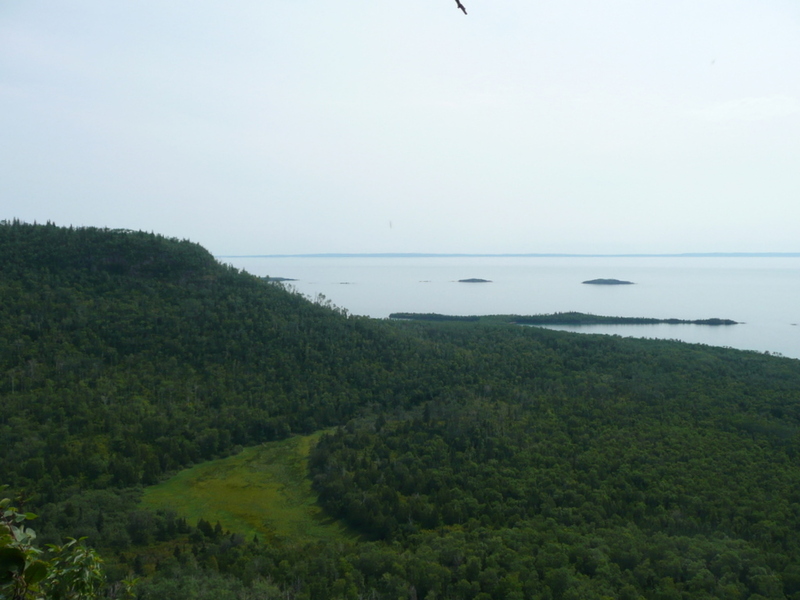 The views from the lookout north towards Sawyer Bay were pretty spectacular and I got my first look down at the impressive vertical rise from the base on Lake Superior. 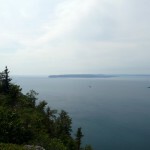 The Head which juts out overlooking the Bay was also visible from the lookout. 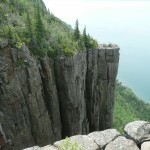 I left the summit, descended the Chest Trail and began my hike back down the Talus Trail. Once past Talus Lake, I was surprised when I ran into a couple of hikers who were carrying their bikes over the rock field (talus). This looked like way too much work and seemed especially crazy considering they had already ascended the steep, rough trail from junction below. 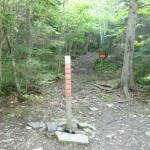 I continued my descent and eventually reached the Top of the Giant Trail junction. While resting at the intersection, I discovered just how popular the Top of the Giant trail up to the Knees was. During the morning I had only encountered the couple crossing the talus field. 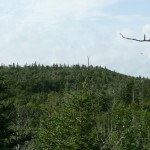 Now above me and below I heard voices from a few different hiking groups. 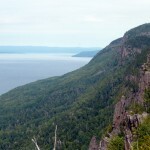 The hike up the Top of the Giant Trail, although laid out as a series of switchbacks, was steep as it ascended 600 feet up the Sleeping Giant . The day had become fairly warm and my lack of water was starting to become a problem. My one remaining water bottle, even after refilling it back at Talus Lake was near empty as I consumed large quantities of water on the trip up. 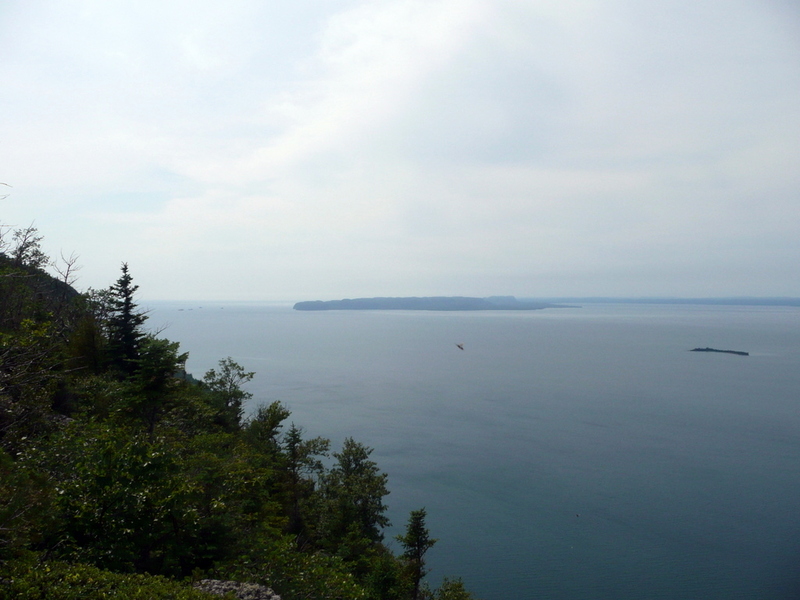 Once reaching the top, the terrain was flat and I continued the hike, initally along the southern cliffs tops with nice views south to Lehtinen’s Bay and Tee Harbour. Eventually the trail headed into the interior to across the Sleeping Giant mesa to the western edge. 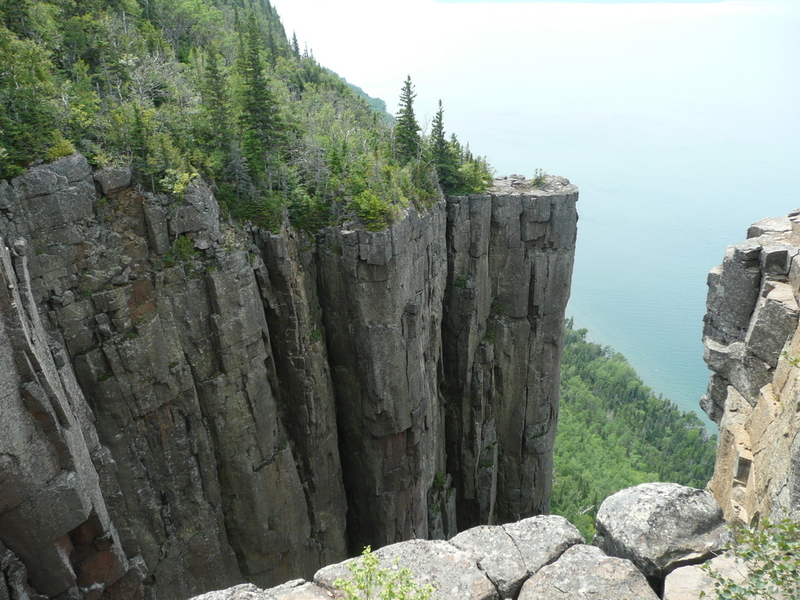 When it emerged at the edge atop the western cliffs, the views west across Lake Superior were impressive. 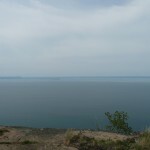 It was a long ways down to the bottom at the lake edge. 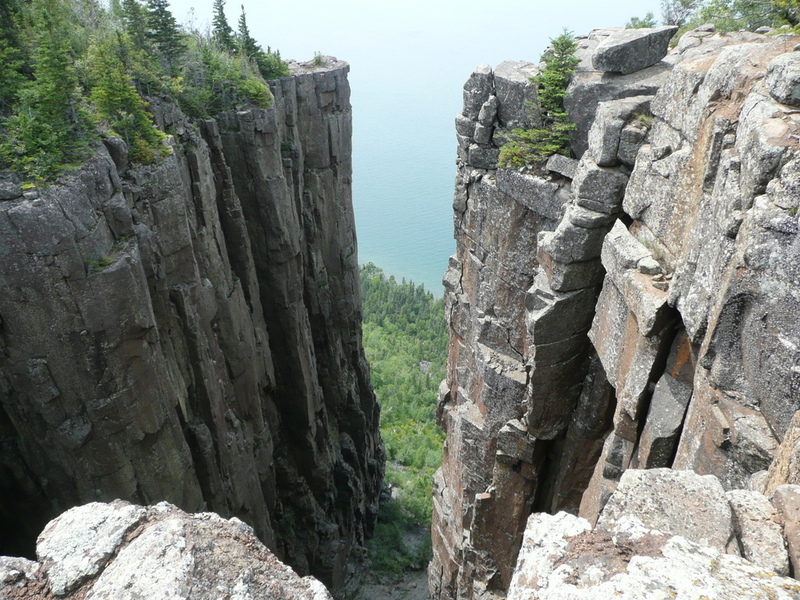 I continued along the trail south and eventually the trail terminated at the Chimney Lookout where I got my first look at the impressive rock formations. I took my time on the way back down the Top of the Giant trail and eventually reached the junction with the Kabeyun Trail and found my bike. 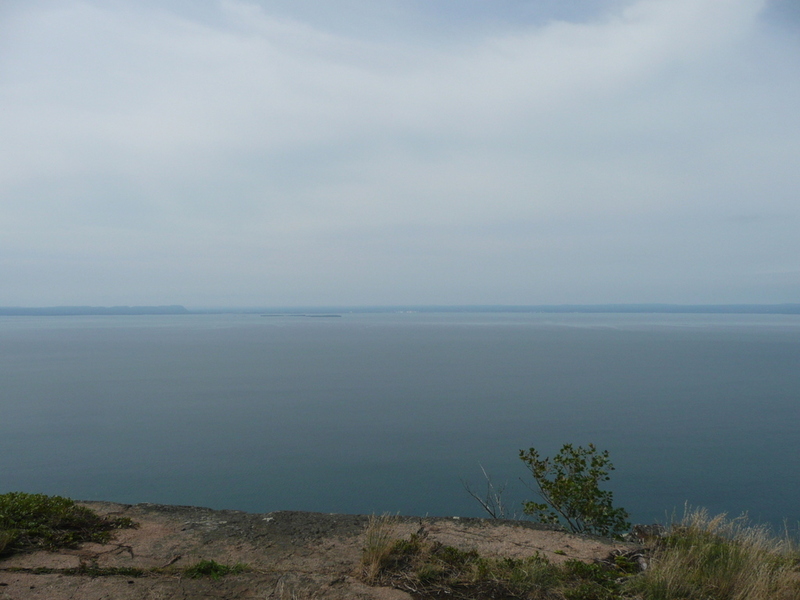 Biking down to Tee Harbour, I was finally able to quench my thirst with some cool filtered water straight from Lake Superior. The trip back along the Kabeyun trail went by quickly, except for the last hill up to the parking area, which I was now dreading after a full day of hiking. It was 5:00 PM when I arrived back at the parking lot. Just made it to the top of the Chest on Saturday. The view is pretty great but you have to find a good tree to climb otherwise you won’t see all that much. There’s probably good views if you keep bushwacking to the edges of the mesa (rather than being at the top) but I didn’t make it that far. 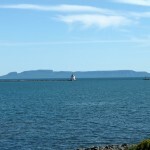 Your photo of the sleeping giant is beautiful, can I use it as a source photo for a sleeping giant colouring page for children? No problem Kayla, go ahead.